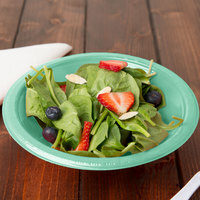 Green disposable bowls are available in several different hues, including an aquatic turquoise, a light pistachio, a deep hunter green, and a bold citrus green, among others, so that you can have a wide selection of different green plastic bowls from which to choose. 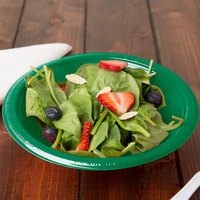 And with such sleek, consistent coating on these bowls, every green disposable bowl you purchase is sure to leave a lasting impression on your customers with its fine appearance. Our selection of green plastic bowls is wholly supplied by some of the biggest name-brand manufacturers in the foodservice industry that have all worked hard to establish their reputations for exceptional product quality and outstanding customer service, ensuring you get a product that you need at a value that helps your business grow. If you're looking for more items to fill out your stock of catering products, make sure to check out our supplies of serving utensils, chafer stands, and chafer dishes. If you're wondering where to buy green plastic bowls, we have a large selection of green plastic bowls for sale at the lowest prices.